The Independent State of Samoa is a country in Pacific Ocean. It became independent from New Zealand in 1962. It has two islands, including Upolu and Savai'i. The capital of Samoa is Apia. It is on the island of Upolu. The head of the country is Malietoa Tanumafili II. Religion in Samoa includes the following: Christian Congregational Church of Samoa 35.5%, Roman Catholic 19.6%, Methodist 15%, Latter-day Saints 12.7%, Samoan Assemblies of God 10.6%, Seventh-day Adventist 3.5%, Worship Centre 1.3%, unspecified 0.8%.There is also about 522 Jehovah's Witnessses in Samoa since 1931. Samoa has one of seven Bahá'í Houses of Worship in the world. It is in Tiapapata. ↑ "Samoa moves into tomorrow". Stuff.co.nz. 7 May 2011. Retrieved 7 November 2011. ↑ "Samoans set to time travel". nzherald.co.nz. 29 December 2011. Retrieved 28 December 2011. ↑ "Samoa: People; Religions". CIA World Factbook. Retrieved 26 November 2007. ↑ "Worn With Pride > Tatau (Tatoo)". Oceanside Museum of Art. Retrieved 26 November 2007. 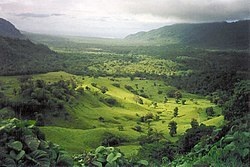 Wikimedia Commons has media related to Samoa. This page was last changed on 1 December 2018, at 11:13.